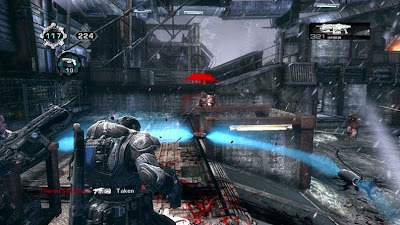 For all of you Gears heads that have been itching for the new Snowblind Map Pack for Gears of War 2, now's the time to get them. Launching today on Xbox LIVE, the new Snowblind Map Pack is available for download for 800 Microsoft Points. Grindyard: A massive industrial complex located in a junk-processing plant from the days of Sera’s industrial excess. The office, now gutted, serves as a perfect place to fortify, but if you’re not careful, you’ll end up trapped inside the office with no hope of escape. Under Hill: Players are taken through snowbound tunnels that were once billed as a feat of Seran engineering. Head for high ground on the bridge and you’ll be rewarded with massive firepower, but be prepared to defend your position and try to escape being cornered. Courtyard: A wide-open battle royale containing explosive weapons that once formed the heart of Ephyra’s fashionable Civic Center. Lines of sight are far and clear here, and battles tend to focus around the elevated sniper nest. Watch your back and keep a fresh clip. Fuel Depot: Back by popular demand, Fuel Depot is a “Gears of War 2” remake of the fan-favorite “Gears of War” map, but winter has set in and the depot is now covered in a blanket of snow. Open and unforgiving, it takes a well-coordinated team to cover all the angles here. Rookie Gear (10 points): Earn enough multiplayer experience to reach level 5 (Public only). Seasoned Gear (20 points): Earn enough multiplayer experience to reach level 15 (Public only). Battle-Tested Gear (30 points): Earn enough multiplayer experience to reach level 25 (Public only). Battle-Hardened Gear (50 points): Reach level 50 and play a match on each of the four Snowblind Map Pack maps (Public only). Veteran Gear (75 points): Reach level 100 and win a match on each of the four Snowblind Map Pack maps (Public only). Never Eat Red Snow (20 points): Complete waves 1 through 10 on all Snowblind Map Pack maps in Horde (any difficulty). Icy Dead People (25 points): Complete waves 1 through 50 on any Snowblind Map Pack map in Horde (any difficulty). Frigid Body Dynamics (5 points): Play a multiplayer match on each of the four Snowblind Map Pack maps (any mode). The Weather Outside Is Lethal (15 points): Win a multiplayer match on each of the four Snowblind Map Pack maps (any mode). Make sure to stayed tuned to NextGen Player when we post our review of the Snowblind Map Pack - coming soon.